You think YouTube delivers poor video quality on your Mac or iPhone/iPad? We’ve made similar observations. We went in search of a possible cause, because it happened again and again lately that we wanted to set the resolution up in the YouTube app on the iPhone, because the picture was so bad. 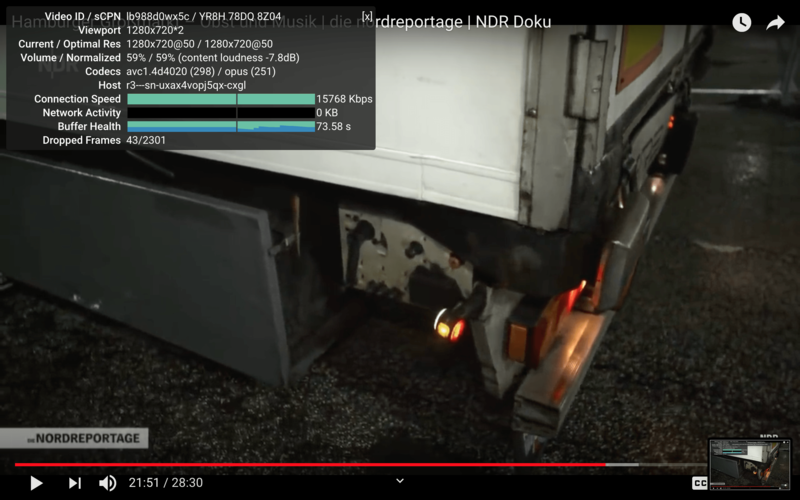 However, it was usually already at 720p. That was a bit surprising, because it were relatively new and official upload of well produced documentaries. The first consideration with a video in bad quality was: maybe the original is also bad! So first we did the counter-test in the official ARD app (German TV station). And surprise: the quality is much better: no blurred details, everything looks like 720p should look like. With the YouTube app we opened up the stats to be sure that the appropriate resolution was selected. It was, and the difference remained serious. 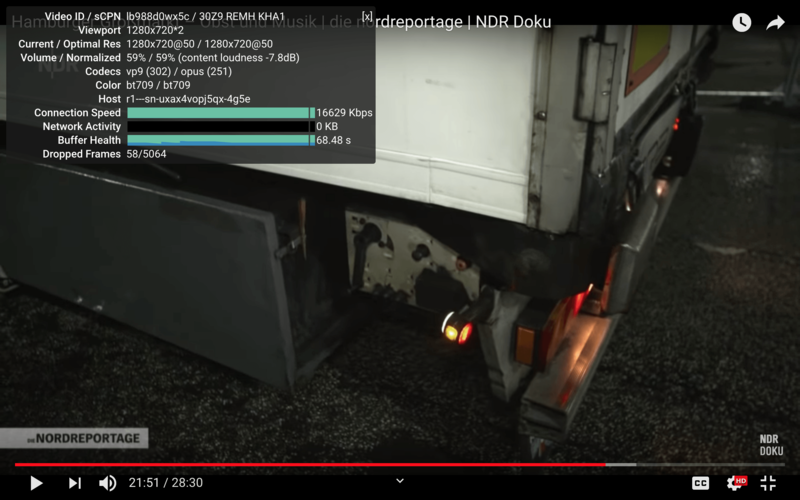 That brought us to the next test on the Mac: We also used the original stream from the media library, then the encoded stream as 720p video on YouTube once as VP9 and once as AVC and for the counter-test once again the video in 480p. And what can you say: you can watch how the quality goes down the drain. Even the better version in VP9 is clearly worse than the original. After all, it’s so compressed that it doesn’t really stand out – YouTube encodes to the limit. The AVC encoded version, which also annoyed us so much that we looked for the cause, is even worse: the picture is muddy, loses essential structures and when movements occur you see compression blocks formed. Why do you also notice that on the iPhone? Because videos are only delivered AVC encoded (here again the reference to the detailed article). And these are deliberately compressed so far that it’s annoying. 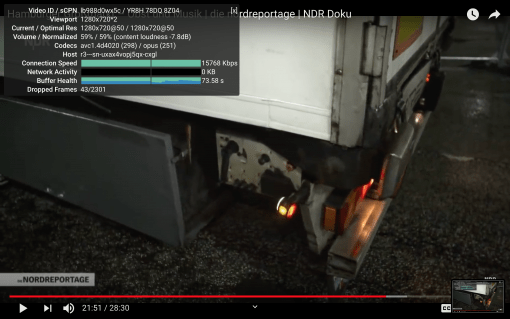 Google provides both the VP9 codec and the AVC codec with the same bandwidth. But since the VP9 is about 30% more efficient, in this case this means that videos encoded with AVC simply look 30% worse. In fact, they are so bad that there is hardly any deterioration to the 480p variant (you remember, tube TV?). Click on the pictures to enlarge them, then the differences become clear very fast. Ignores the dropped frames – we have just fast-forwarded back and forth. In short: Google wants to push the VP9 codec, but also has to operate older and mobile devices with H.264. And iPhone, iPads and Macs, on which you surf with Safari, also fall into this category. Apple’s new, efficient codec supports h.265, not VP9. So YouTube deliberately only gives you pixel porridge because the company doesn’t want to join the H.265 codec and Apple doesn’t want to support VP9. A workaround? On the Mac you can either use Chrome or even better Opera to play the better VP9 encoded videos, even in higher resolution than 1080p (this limitation is also the intention of YouTube). Since there’s no hardware acceleration for VP9 except for the latest Macs, the battery life is affected, because the computing effort is quite high. On mobile devices we can only advise you to leave YouTube on the sidelines: if there is a corresponding production in an official media library app, the quality is worlds better. Even watching it in the browser is often sufficient. You just have to bypass YouTube. Does this apply to all available YouTube videos? No, we haven’t found a clear scheme yet. Some videos in 50p had excellent picture quality, although they were encoded with AVC. So it’s just the bandwidth. Maybe Google is using the compression only bit by bit or only sporadically to see if we notice it. You know now anyway and you have the effects of two not to bath yourself on a standard of sensible companies: A fantastic iPhone display with poor quality content streamed from YouTube.